Our apartment faces north, and when there aren’t clouds over the North Shore you can see the mountains over the rooftops of the buildings across the way, and it’s very nice except when you look down and then it’s mostly just alley. A tree blocks the light from the living room window, which faces east, and the only two other windows on that side are in the bathroom and the bedroom, and there the blinds are always drawn because it’s possible to see into at least ten other apartment bedrooms from there. Lately, there hasn’t been much light, and this place feels dark. At night it’s nice, because our rooms are not very well lit, so the yellow light of a few table lamps creates warmth, and the glow of a few candles makes us seem more attractive. But during the day, lately it’s just been grey. November is an ugly month. It’s the warm-up to the holiday season but the sparkle isn’t here yet, and I’m impatient. I want glitter, not rotting leaves, and Christmas songs and puddle-free sidewalks that shimmer with fresh frost, and to be able to wear my sweater with the reindeer on it already. I don’t like dark hallways or radiators that tick like bombs. There is a chill, for sure, and the smell of snow in the air, though none has fallen yet. I don’t want to do anything but sit around in my flannel pajamas and eat soup. 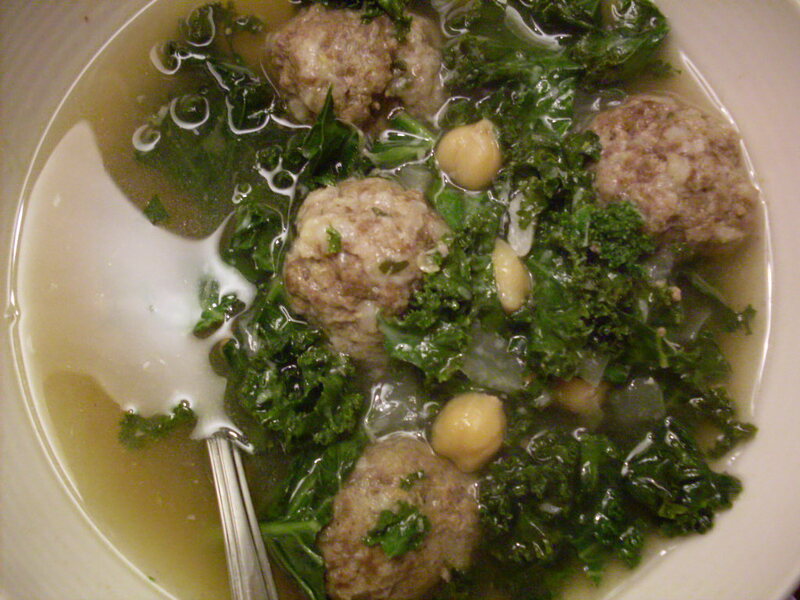 Fortunately, this is an easy, hearty soup recipe, with meatballs for comfort, kale for health, and chickpeas because I love them. It’s best if you make your own stock; it’s not mandatory, but the smell of bones and veggies and herbs simmering in your kitchen for an hour or two is comforting, and will do magnificent things for your mood some drab November evening. 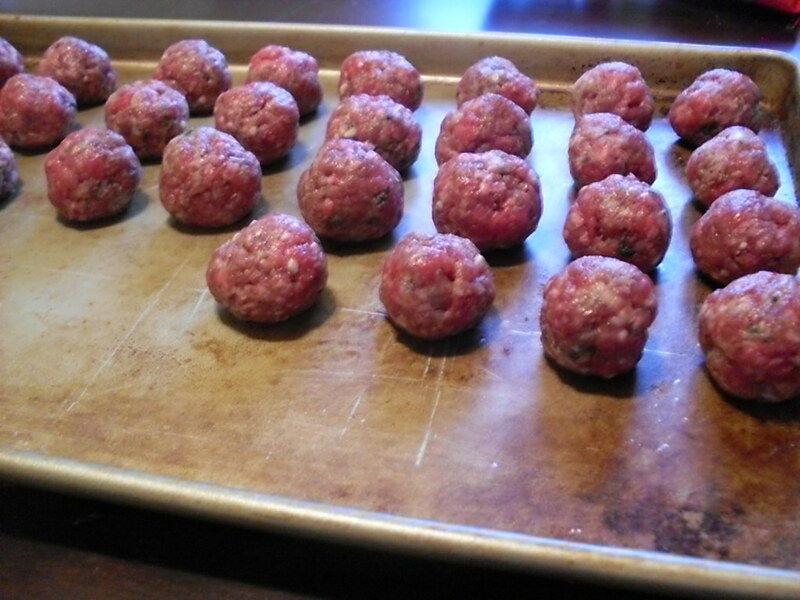 This will come together pretty quickly; if you make the meatballs ahead of time you can have this steaming in bowls on your table in under fifteen minutes. In a large bowl, combine beef, bread crumbs, cheese, garlic, oil, egg, parsley, Worcestershire sauce, pepper, chili flakes, and salt, and squish the whole thing around with your hands, just enough to mix the ingredients and no more. Roll this into balls about one-inch in diameter – you should end up with 28 to 30 balls. Meanwhile, sauté onion and garlic in olive oil until translucent. Add wine and stock, and bring to a boil over medium high heat. When stock begins to boil, reduce heat to medium, and add meatballs. Simmer for five minutes, then add the kale and chickpeas, and simmer for another five minutes. Just before removing from heat to serve, stir in cheese and parsley. Taste, adjust seasonings as needed, and serve with additional grated Parmesan and a few drops of good olive oil. This is best with crusty bread. Almost all things are. < Previous Potato and kale “Dutch” quesadillas. Next > Coq au Riesling. That could be delicious, I will have to try it. 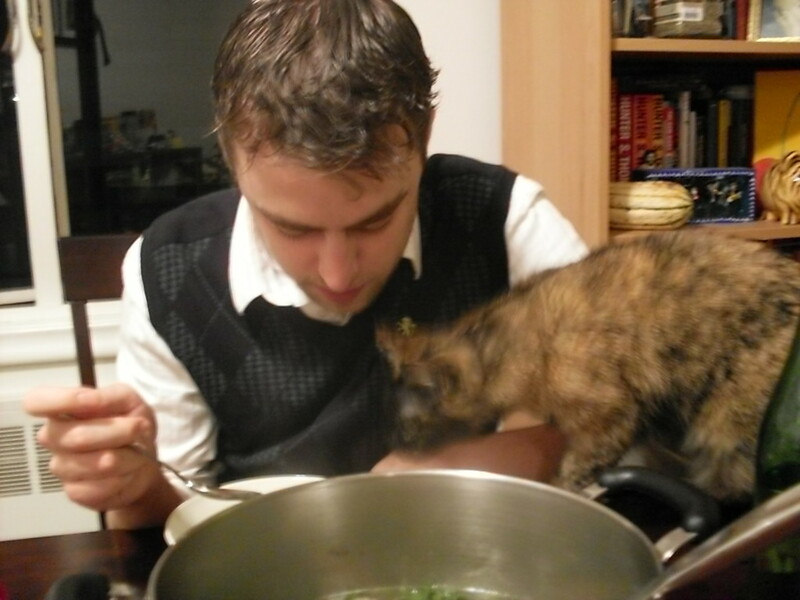 Whenever I crave Kale I usually get it steamed, I bet I would like it in soup too! 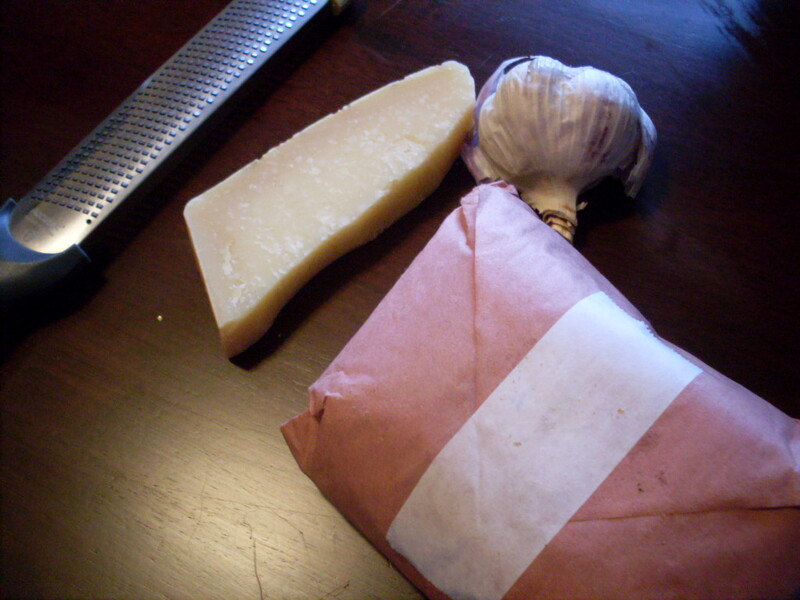 any dinner that starts with a package wrapper in butcher paper, a head of garlic, and a block of Parmesan is going to be good. I made this soup on Friday and my husband and I LOVED it. The flavor was so complex. It is addicting. Will make it again soon. Thanks for a great recipe.